Flathead Lake is a great winter fishery. Depending on the snow and ice conditions we usually can launch at West Shore State Park . 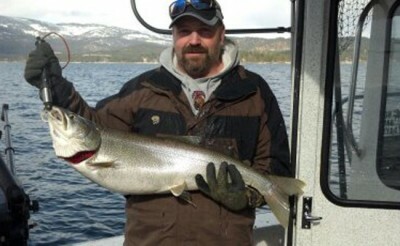 Winter is my favorite time to target the trophy size lake trout over 20 pounds. 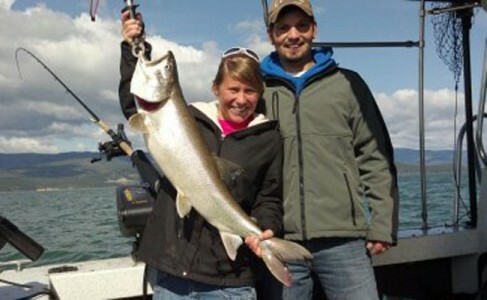 Trolling the big flats in 160 to 200 feet of water will put some big lakers in the boat. Try a T-50 flatfish or a M2 SP flatfish from Worden’s, better known as a Mag-Lip. These flatfish have a very fast action and rattles in the body that create a lot of vibration and sound. I like to put down the two outside downriggers and one steel line straight down the middle. On the steel line, I like to put on a T-60 Flatfish in a glow white Luminous. Remember to troll these flatfish around one mph. These big lakers will not chase a fast moving lure. Also, a slow troll with Brad’s Super Bait close to bottom works well. Try using some cut bait or sausage in the Super Bait for a scent trail. Remember to use a good snap swivel with these spinning type baits, so you don’t twist your line. Schedule your winter fishing trip today by calling Captain Bob at (406)755-4414 or stop by the Mo Fisch website.